It is easy to misunderstand the idea of turning towards the things that scare us, especially those that lay within ourselves, and accepting them. Many think that acceptance means "just accepting" whatever happens. But, while acceptance is one part of the foundation of mindful practice, no one is saying "just accept it", especially with all the horrible things that can occur in this world. Rather, acceptance is realizing the way that things truly are and finding ways to be wise in our relationship with them. Then we act from the clarity we gain by turning towards what is and letting go of our illusions of control. Acceptance isn't passively resigning ourselves to what happens. If everything is falling apart, if our dreams aren't going to be fulfilled, if the wolf really is howling at our door, then being aware of it, no matter how scary, gives us a place to stand. From this place we can take steps which truly fit the situation. When we keep an illusion of control, we often act with anger, denial or avoidance. We won't see how things really are, we won't know how to act. Or we might be overwhelmed by fear, use poor coping skills (did anyone ever finish a pint of ice cream when they were upset? Tasty maybe, but it didn't make the howling wolf go away), act in anger or use other forms of acting out and distraction. Acting in these ways clouds our minds just when we most need the skills that we've cultivated through mindful practice: clarity, equanimity, an awareness of the real core issue which allows us to work with it rather than have it work against us. A couple of days ago, I spoke with my friend who has cancer. That person said to me, "I didn't want this and was terrified of it, but it turns out that it has made every moment precious to me and that my life means so much more". I've heard others say similar things through the years as well and to me it's an amazing response to a place that could so easily be filled with fear and anger. I can't say enough about the power of acceptance as a means to clearly see what we face and what we feel. While this may seem like its some abstract philosophical concept, as we develop the skills of mindfulness and acceptance, we find that there applications throughout our lives. I recently spoke with an athlete I work with who broke a bone which will keep that person from competing for a while. I asked how they were feeling and what their plan was. They talked about their fear that they'd lose their edge, but also about reconnecting with friends, cooking and other activities that they enjoy. As we talked, we developed a plan to accept the flow of this period and to work with it rather than to be angry. To use the unstructured time to not just connect to things outside of their sport, but also to use the time to develop good patterns of self-talk, to practice visualizations geared to improve their performance once they are able to start-up again and to otherwise use the time to grow. Another athlete recently told me something similar, that due to some knee problems, they aren't able to ride as hard as they are used to. For them, this is really challenging (it would be for so many of us) as they are very competitive, and they talked about their frustration and anger. We talked about it, about their fear that they'd never ride as well as before and that they felt like less of a person because of that (the scariest part for them). As we talked, they started talking about other parts of life that are important to them. 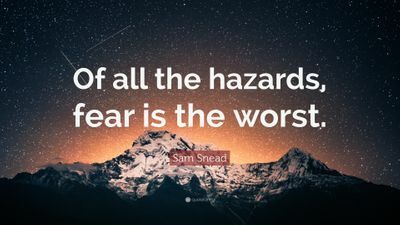 By turning towards the fear, the scary part, they were able move away from their frustration and fear and realize that they are much more than just someone who is able to push big watts. That those who love them, care about them, will do so whether they bike or not. After about 20 minutes of us discussing all this, they said to me something like "I guess there's nothing I can do about my knee but to take care of it...give it time to heal and see what comes next." You could almost see the anger flow away and be replaced by compassion and clarity about what they could do and an acceptance of what their path may be. Not that they were happy about things, they just weren't fighting it. There are so many ways in life and in athletics that turning towards and accepting can help us achieve our goals. By accepting that I really should be riding in the "B" group, I may actually enjoy cycling more. By accepting that my FTP number doesn't determine myself worth, I can ride at the level most likely to help me grow and get the most out of the workouts -- getting me to my goal, versus constantly overtraining. The process of accepting may lead us to feel fear or disappointment or sadness for a short while, but it really will set our energy free and allow us to be at our best by being in tune with life's flow.